Earn $0.79 in Rewards credit. Click to learn more. 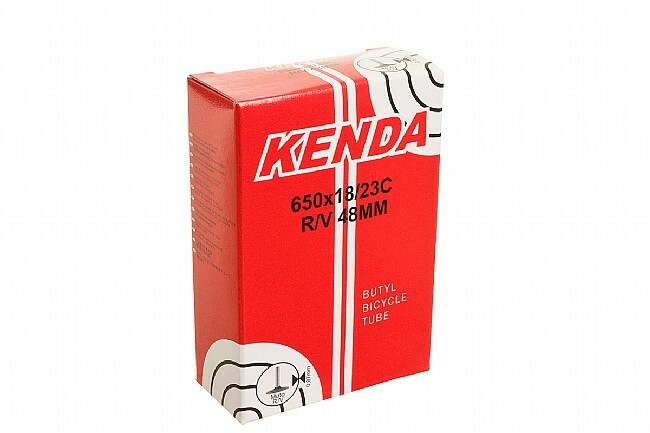 A reliable and economical standard weight butyl tube sized for 650c bike tires. Select width and Presta valve length from the pull down menu. 650c (571 ISO). Please note: Listed weights may vary by as much as 10% due to variances in the manufacturing process. Inexpensive, functional 650c tube for my 10 yo's bike - a former time-trial race bike now repurposed as a kid's road-bike. Paired with 28mm wide Panaracer Pasela tires, the tubes are taking some childish abuse without puncture or complaint. Affordable and reliable tubes. Could pay more, but why? Likes: always fast delivery and good product. Tubes in this size are hard to find and the quality is great. 650's are not available everywhere, plus the long stems are great for deep rims eliminating the need for an extender. The 80mm stem is much more convenient than using valve extenders. just like any other tube, it does it's job. This tube size is difficult to find. I use this tube on all my bikes with 650 size wheels. The 80mm stem is necessary for my zip wheels. the long stem is great for use with my zipp wheel. I am using these tubes on a Quintana Roo Kilo with 650c wheels and they are working great! Great value for a hard to find tube. Good quality. It can be difficult to find inner tubes in 650c size. The 80mm long valve stems work well with my Zipp 404 wheels.